There are few classes of consumer electronics that have had as exhilarating heights and as cringe-inducing lows as video game consoles. Since the Magnavox Odyssey plugged into TVs back in 1972 and delivered Pong to the masses, gaming consoles have demanded our attention. Some have been extraordinary. Atari, Nintendo, Sony, and even Microsoft have all changed how we think and interact with video games. But while there have been remarkable successes in gaming consoles, there have also been many unmitigated failures—systems so ill-advised, so poorly planned, or so terribly marketed, that they were doomed to e-waste facilities and top shelves of closets as soon as they appeared. These are some of those. In 1983, the video game market crashed. It was such a catastrophic event and nearly took every video game maker with it. One console axed as soon as the market fell was the Magnavox Odyssey 3 “Command Center.” It was going to be incredible, for 1983: rich 8-bit graphics, a 300 baud modem, and mechanical keys. It was even shown off at CES—where Magnavox declared it was “about to change the name of the game.” But Magnavox was forced to kill the console before it could come to the US. That didn’t dissuade the parent company Philips. The owner of both Magnavox and the Odyssey brand decided that a video game crash in America didn’t have to ruin everything. It released the Philips Videopac +7400 in the UK and France. Its extremely limited European release seriously hurt Philips, but didn’t completely destroy the company’s designs on the gaming industry. Eight years later, Philips would release one of the most notoriously bad consoles ever made: the Philips CD-i. Besides being bad the CD-i is also the only non-Nintendo system to ever have a Zelda game on it. Having played both Zelda: The Wand of Gamelon and Link: The Faces of Evil for the CD-i I can safely say that isn’t a good thing. Electronic Arts founder Trip Hawkins had a dream in the late ‘80s. He was going to completely change the video game industry. Instead of the console makers running the show, it was going to be the software guys. Hardware companies could license the tech and build consoles that would run a huge library of games, and the fees for game designers would be low, to encourage them to build on the 3DO platform instead of competitors like Nintendo or Sega. Time declared it one of the best products of 1993. But the 3DO was doomed. First there was the problem that any Kickstarter fan can confirm—designing and manufacturing software is very different from designing and manufacturing hardware. No one actually wanted to make a 3DO machine. Panasonic finally agreed and built the Panasonic FZ-1 R·E·A·L 3DO Interactive Multiplayer, but the FZ-1 was $700. That’s an insane price now, and a ridiculous one in 1993, when a SNES went for $90. The other problem was competition. 3DO was coming up against the well established SNES and Sega Genesis, and Sega Saturn and the Sony Playstation were just around the corner. Plus it was feeling heat from the even more powerful Atari Jaguar. By mid ‘90s, most people had given up. “I think 3DO is really struggling,” Atari CEO Sam Tramiel told Next Generation in 1995. He was right. By 1996 3DO was dead. 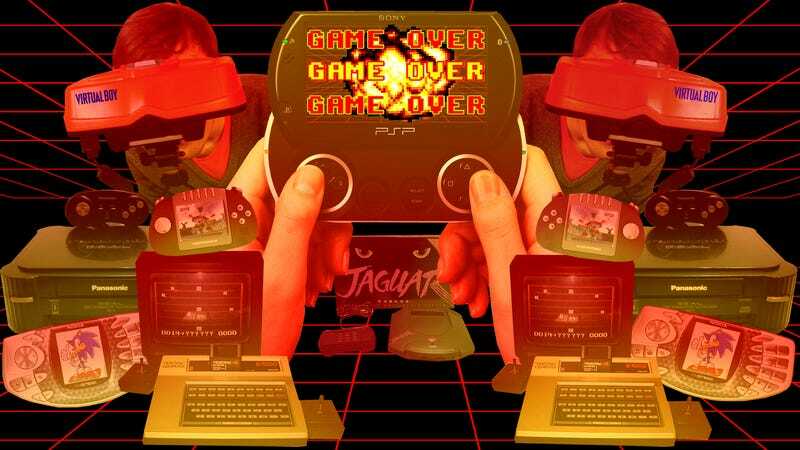 When the Atari Jaguar landed in 1993 it was during one of the fiercest console wars the video game industry has ever seen. The Super Nintendo and Sega Genesis were duking it out in stores and on playgrounds, and 3D0 was trying to stake its own claim, poorly. Atari was sure that its Jaguar, the first 64-bit game console ever sold, would win on specs alone. “Everything that you see that moves will be 3-D,”an Atari rep told the New York Times in the summer of 1993. Unfortunately, as noted by Computer Gaming World, the console shipped a week late, when it finally shipped to all American markets in early 1994. There was also a CD player, a planned VR headset, and a Jaguar 2 that Tramiel expected to release in 1996. But as he admitted to Next Generation, Atari was losing money on the poorly performing Jaguar—so much money that Atari was forced to merge with JT Storage in 1996, and was then sold off to Hasbro in 1998. This list is full of embarrassing devices that companies claimed were amazing, but SNK’s Neo Geo Pocket Color was actually amazing! The screen was gorgeous—it could do SNES level graphics in the palm of your hand in 1999, just eight years after the launch of the SNES. And it had Neo Geo’s library of excellent fighter games. But no one outside of the kids who haunted arcades knew what Neo Geo was. The Neo Geo and Neo Geo CD consoles had both failed to grab an audience in the US—despite the massive success of the Neo Geo arcade system, and the Neo Geo Pocket, the color’s predecessor, hadn’t even been available in stores in the US. Which is why the New York Times characterized Neo Geo as an “upstart” in a 1999 story on the Pocket Color. “These guys are going to have a very hard time getting any widespread consumer acceptance,” Jeremy Schwartz, an analyst, told New York Times at the time. “They’re the master,” he said of Nintendo. And Schwartz was right. Retails didn’t care about the product and didn’t feel like making consumers care either. The Pocket Color had just 2 percent of the market in 2000. Things got prodigiously worse in 2001. That’s when SNK itself went bankrupt, brought down by poor sales of the Pocket Color and a dwindling market for its arcade machines. It might seem like augmented reality is only now seeing serious development. Apple is rumored to be working on an AR solution, Google finally launched the AR-centric Project Tango last year, and Magic Leap might be super secretive, but it’s drenched in hype. Yet game makers have been trying to get people to embrace AR for decades, and no attempt was more ill conceived than Tiger Electronic’s R-Zone. The Virtual Boy, which required you laying on your stomach with your face pressed to a stinky mask and provided a bleeding red version of Mario playing tennis in stereoscopic view, was not. The New York Times would characterize it as a “goof” just two years later. Like the Virtual Boy, the R-Zone and its peripherals were absolute junk. In a scathing review, David Jones of the Chicago Tribune called it a “waste of time and money.” Ouch. Nintendo has made some bad choices. The Virtual Boy and Wii U being the two best examples of its failures, but the Virtual Boy failed because it was too ambitious, and the Wii U has struggled because of a flawed launch and an unwieldy controller. But only the 64DD failed because it really was ahead of its time. Consumers and designers simply couldn’t wrap their heads around what the 64DD could accomplish. While Sony was insisting CD-ROMs were the future of gaming (Sony was right), Nintendo insisted there needed to be room for storage systems that let you write to them (Nintendo was also right). The 64DD was an add-on to the Nintendo 64. It would read magnetic storage devices that resembled giant floppies. It could also write to the storage discs, thought a slower speed than a N64 cartridge. The big appeal, for Nintendo, was that it could hold more data and was cheaper than a N64 cartridge. That should have given game designers more flexibility—a game released in Japan let people upload images of their faces to create rudimentary Mii avatars. Unfortunately game designers didn’t get the N64DD either. Only 10 titles were released, and only about 15,000 64DDs sold. Nokia is currently making a lot of waves by embracing the terrible nostalgia tech trend and launching a new Nokia 3310. Let’s hope the company doesn’t try to recapture any N-Gage magic though. Mainly because this thing was terrible. It made tremendous sense on paper. In 2003, Nokia was a titan of mobile devices and a natural next step was to combine its excellent phone design with a game system as good as the well stablished and critically acclaimed Gameboy Advance. While Nintendo had wasted every previous mobile gaming competitor, the odds were, ostensibly, pretty good. Nokia could take on Nintendo. No, the Gizmondo, which was released in 2005, is not named for Gizmodo, which launched in 2003. They are very different. Both had intense Europeans at their helm in 2005, but to my knowledge Nick Denton never wrecked a Ferrari so badly it got a full story in Wired. Wired paints a pretty picture of Stefan Eriksson’s company and product, Gizmondo. The piece notes that Eriksson once hoped he could move half a million units in a few months. This is not true. In fact, the Gizmondo sold so poorly that in 2011 GamePro declared it the worst-selling console of all time. It wasn’t the console’s fault. It wasn’t attractive, had a poor selection of games, and CNET gave it just 2.5 stars. But the Gizmondo had buttons that felt nice, GPS, a camera built in, and the games came on standard SD cards. It was, in many ways, less of a game machine and more of weird-looking precursor to the smartphone. It was also incredibly expensive, and Eriksson was a noted crook who ended up in jail and then later kicked out of the US and told to never return. The PSP and the Nintendo DS launched during the same holiday season, and while the PSP was a technically superior device, it could never compete with the DS’s durability or price. So in October 2009, Sony released the PSP Go. It would have the same gorgeous screen and underrated game library, but would be much more compact, with the display sliding up to reveal the controls. “It breaks my heart,” Mark Wilson said in his review at Gizmodo. He noted it held up just fine against the larger PSP and the Nintendo DSi. But those devices weren’t the problem. Between 2005 and 2009, the smartphone had taken over. People played games on iPod Touches and Motorola Droids. “Compared to the advancements in PMPs and smartphones as of late, it’s just very difficult to sit in awe of the Go’s inelegant hardware and clunky software,” Wilson said. Customers agreed. But Sony hasn’t. The company continues to build mobile gaming devices, even in the face of smartphone competition. Sony’s current system, the Vita, is better known for how ignored it is by the company than for any especially spectacular game on the system.